Android is one of the most popular operating system world-wide today as it provides a huge collection of apps and also because it is user-friendly, easy to use with lots of new features that are being added time and again that makes the user spend there most of the time with their Android device but sometimes we can not install app on our phone because of different errors.Parse Error is one of the common error of android. 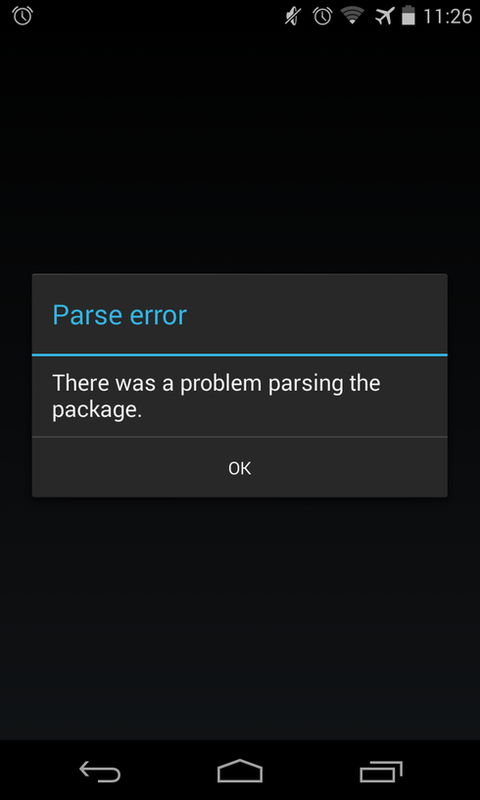 This error occurs while installing an app and a message is displayed saying “There was a Problem Parsing the Package”. Now you don’t have to worry anymore. Here I will show you some of the method toFix Parse Error and even the reason behind the error. Reasons for the Parse Error. 1.The Downloaded .apk file might beCorruptedor notfully downloaded. 2.Installation of apps fromUnknown Sourcemay bedisabledin your phone. 3.The app isnot compatiblewith your Smartphone or version of OS that you are using. Now, as we know the reason behind the error. Let’s find outHow To Fix Parse Errorby following the given methods. Mostly we download the app from Google Play Storebut sometimes we even download it fromunknown sourcesas a result android doesn’t allow us to install the app and we face this error.One of the most common fix to this problem is toEnable“Allow installation of apps from unknown Sources”. Follow the step to Enable the option. *.Enable the option Unknown source to allow installation from other sources. Once you have finished the above steps you may now try to install the app which was showing you the parse error. If the error is fix then the job is done other wise follow the next method. Now try to inspect the downloaded apk file to fix parse error. Check whether it isfully downloaded or corrupted. If you have downloaded it (app) out of Google play store then try to download it again from Google play store and try again. If it’s not available in Google play store, try to have a fresh apk file that is not corrupted and try to install it again. Some of the website to download the apk file areapkmirror, apkhere, AndroidDrawer. Hopefully, it will fix the parse error. If the above two methods didn’t work and you are still getting the error message then it indicates that the app isnot compatiblewith your device or version of OS that you are using. Try to install it on another android device and check whether it works there or not. If it works in another android device which have newer version of OS and have powerful hardware then try other apk file from other site so that it will be compatible in your device. Do not conclude that this method does not work just after one attempt. I tried 10 different websites for apks and finally I was fortunate enough to get the compatible apk. So search for the compatible apk for your device. Sometimes it has also found that older version is compatiblefor your device. So, try it also. For example: Search, Chrome old version or chrome 2014 version if the latest version shows the error message. Note:If your Android device has got latest OS then try downloading latest version of .apk file and if your device has got older OS or your OS has not been upgraded then try downloading older version of .apk file . It should work fine after that. So these are some of the method to fix your parse error”There was a problem parsing the package“. If these methods works for you or you have any other solution to this error then feel free to share your thought in comment section below. Hopefully your error has been fixed by now.